Click on image for large Press Release Image. WDR Big Band rehearsing my arrangement of “Beautiful Love” (from Madcap CD) before concert performance in Siegen. Featuring John Goldsby on bass, Ludwig Nuss on trombone, and Karolina Strassmayer on alto sax. Charts & Study Scores from “Madcap” available here. Charts and Study Scores from “Next Step” available here. Chuck Owen & The Jazz Surge. Charts and Study Scores from “Whispers on the Wind” available here. My article for the ISJAC Guest Artist Blog series entitled: “The Problem Approaching Composition from an Improvisational Perspective”. 2019 Jazz Composers Symposium Right Around the Corner!! Register NOW! This is always an amazing 2 ½ days . . . . don’t miss it!! Best . . . .Gift . . . . . Ever!! This incredible sculpture looks quite at home here in the mountains of North Carolina, doesn’t it! 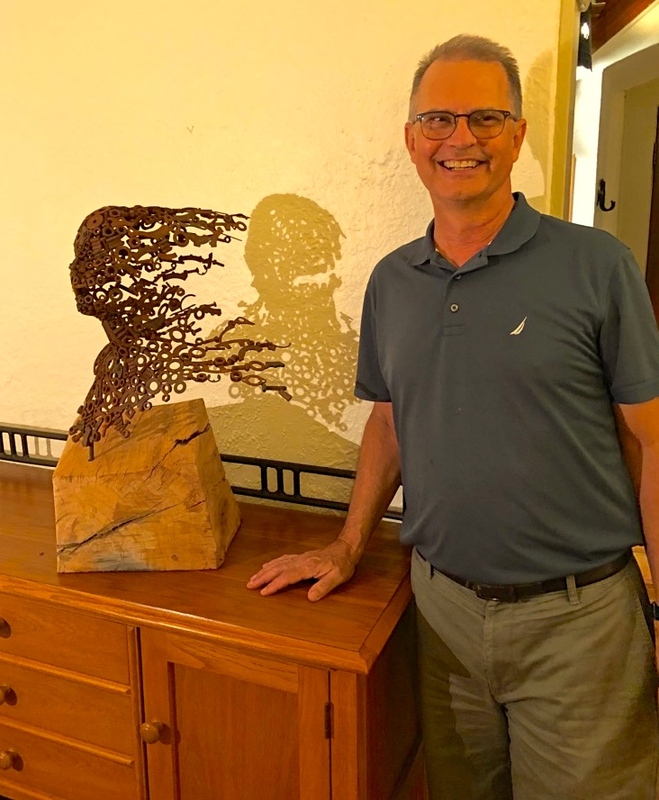 I have rarely been as moved or touched as when the members of the Jazz Surge presented me with this piece they had specially commissioned from Penny Hardy, the British artist whose larger than life “Blown Away” sculpture is featured on our “Whispers On the Wind” CD cover. Wow . . . . . words still elude me . . . . . . . .!! Two of my USF student composers have received national/international recognition and awards for their work within the last year. Most recently, Simon Lasky (current MM student in Jazz Composition) was the winner of the British Composer Award for Best Small Group Jazz Composition for his work “Close to Ecstasy”. The ceremony was in London with coverage and an interview with Simon by the BBC (amongst others). Matt Horanzy’s (MM in Jazz Comp, 2018) composition “Init 1” was the national winner of both the National Band Association’s Jazz Composition Contest as well as ASMAC’s (the American Society of Music Arrangers and Composers) Bill Conti Big Band Competition. As a result of the NBA award, the work was performed by the famed Airmen of Note in December at the Midwest Band Clinic in Chicago. Matt has been accepted to participate in the BMI Jazz Composers’ Workshop in Fall of 2019. Both were selected to present at the upcoming Jazz Composers’ Symposium. Big congrats!! Keep in touch with Chuck!